Create school forms for easier transactions. Every educational institution needs school form printing for two reasons: They legitimize your schools image, and they make every transaction easy. School forms help your institution form the right impressions. 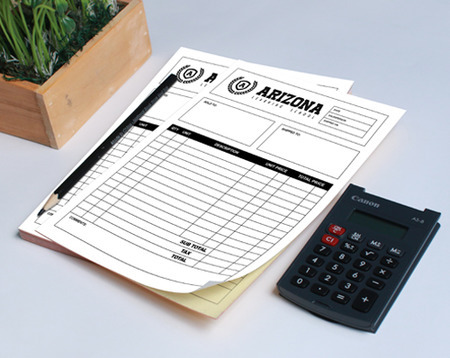 Carbonless forms can be used for school registration forms, invoices, receipts, or any standardized forms.If you need forms that have to be easily duplicated, our school carbonless form printing options have you covered. Carbonless forms are much like old carbon copy forms, allowing you to make duplicates without additional devices. That’s where the similarities end. Unlike the old carbon forms, carbonless forms (also known as NCR or no carbon required forms) leave no unsightly smears, and are biodegradable. And unlike with carbon copies, no separate sheets are required either. Carbonless forms rely on the pressure of your writing instrument on the initial sheet to create a chemical reaction that marks the sheet directly under them. You can stack these sheets to create multiple copies of one document. PrintPlace lets you create multipart forms with up to 4 sheets, conveniently colored for easy filing. School NCR forms are colored in the following sequence: white (top sheet), yellow (second sheet), pink (third sheet), and gold (bottom sheet). Need help with custom school form printing? Give us a call. Add your school and school org logos, mottos, and artwork at the head of each form and spread school pride with each document. Add contact details to make it simple for anyone with a copy to get to the right people with no delay. Ready to print? Get started with your school form printing.